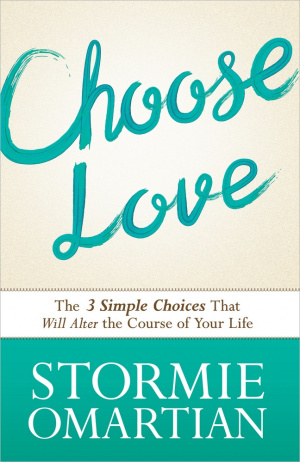 Choose Love is Stormie Omartian’s guide to reflecting on God’s amazing and great love for you. Understand the depth of God's love for you, Let the power of His love transform you and learn how to effectively express your love to others. Taking a fresh look at this powerful aspect of knowing the character of the creator God, Stormie helps you understand the depth of God's love for us, receive it fully and express it completely. In learning how to effectively live out our lives for God, Stormie Omartian points to our need to be motivated by the power of love in all we say and do. And you can’t do that unless you’ve fully experienced God’s love for yourself. But how do we do that? Being taught about God’s love is one thing, choosing and knowing for yourself is another thing altogether - an essential thing if you’ve a heart for all the things of God. Stormie Omartian’s bestselling books on the power of prayer have changed and empowered the lives of millions around the world. Her books have brought many into the reality of the Holy Spirit and inspired many to accept the role of prayer warrior for God. In Choose Love, she shows you how to make an intentional response the greatest gift God has for you and for your growing personal, family and wider prayer ministry. She writes: "One of the many ways we can show our love to God is to deliberately choose to show love to others and in every situation. We can only accomplish this with the guidance and enablement of the Holy Spirit. When we do that, God blesses us and transforms our lives in ways we cannot even imagine." Seeking to make you fully aware of God's pleasure toward you, Stormie’s book reveals that sometimes this involves making difficult choices; but the rewards that follow are far more valuable than anything else we may think we desire. Choose Love will help you do just that and lead you into at transformation your heart, your relationships, and your future as you step knowingly into God’s love and let this inexhaustible resource power your life and character. Choose Love by Stormie Omartian was published by Harvest House in September 2014 and is our 14825th best seller. The ISBN for Choose Love is 9780736958974. Be the first to review Choose Love! Got a question? No problem! Just click here to ask us about Choose Love. Stormie Omartian's bestselling books on the power of prayer have touched millions of lives. Recent books have taken a closer look at the leading of the Holy Spirit and the call to be a prayer warrior for God. Now Stormie takes a fresh look at another powerful aspect of knowing our Creator... His amazing and great love for us. We reflect God most clearly when we are motivated by the power of love in all we say and do. But first we have to understand the depth of God's love for us and receive it. Then we must learn how to effectively express our love for Him. "One of the many ways we can show our love to God is to deliberately choose to show love to others and in every situation," says Stormie. "We can only accomplish this with the guidance and enabling of the Holy Spirit. When we do that, God blesses us and transforms our lives in ways we cannot even imagine. And we will have a sense of God's pleasure toward us that is far more valuable than anything else we may desire. This book is about making that sometimes difficult choice and the rewards that follow." Transform your heart, your relationships, and your future as you press into God's love and let the power of His life and character move through you.